Critics accuse Kanye West of having a God complex, but he did do the impossible yesterday on live television: he left President Trump speechless. With news media cameras flashing, Yeezy went all-in on a variety of topics, ranging from “my MAGA hat makes me feel like Superman” and how Air Force One should be replaced with an iPlane to how the solution to police brutality is “love” and that the 13th Amendment (which ended slavery) is a “trap door” for African Americans. You can see the full clip below. Social media lit up about Kanye’s wild proclamations, the fact that he dropped F-bombs in the White House, and that he revealed his phone password (it’s 000000 BTW). Other outspoken entertainers, such as actor Jeffrey Wright and rappers T.I. and 50 Cent, called West out for his blatant ignorance. 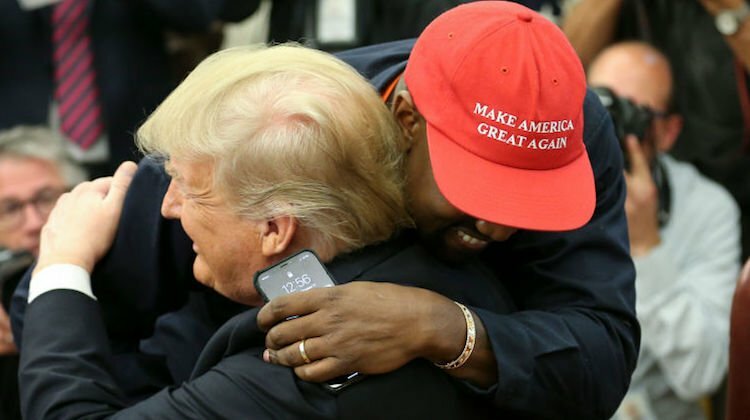 Old Kanye fans would say that he’s off his meds, while the business-minded might argue that he’s tapping into the Trump media machine to peddle his new album, Yandhi (dropping Nov. 23), but we say that it’s because President Obama didn’t give the sensitive rapper the love he wanted.